For the last week, all of my non vegan friends have been raving about this new yogurt kale dip that Trader Joe’s just started carrying, even those that don’t like kale. The dip had me intrigued. I read the ingredients, smelled it and asked my friends textural questions determined to mimic it. Not sure what the original version taste like but I do know this is a mild flavored tasty dip that even the little vegan loved. I would also like to take a moment to thank the little vegan for decorating the dip for the picture! Bring water to a boil. Boil kale for three minutes, drain and set aside. Saute ingredients from mushroom to garlic in olive oil for five minutes. Blend mushroom mixture to a puree with a blender, processors, or smart stick (I finally used mine & love it.) Mix kale, mushroom puree and remaining ingredients together. Refrigerate for 30 minutes so it may thicken. 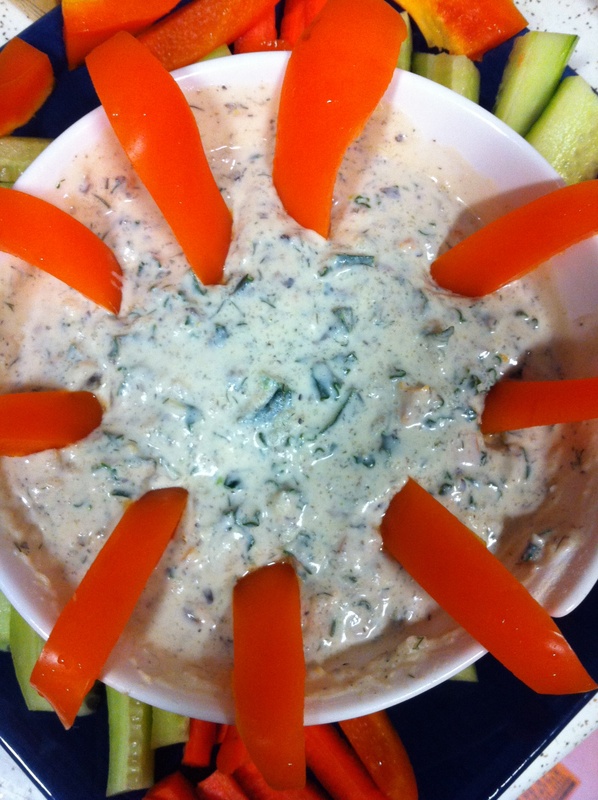 Enjoy with veggies, chips, your favorite dippers or spoon. It tasted great without xanthan gum it was just a little runny. Gallery | This entry was posted in Anzia's picks-a young vegans perspective, appetizer, dressings/sauces, Gluten Free and tagged Trader Joe's. Bookmark the permalink.